I think meatballs are one of my treat dishes. 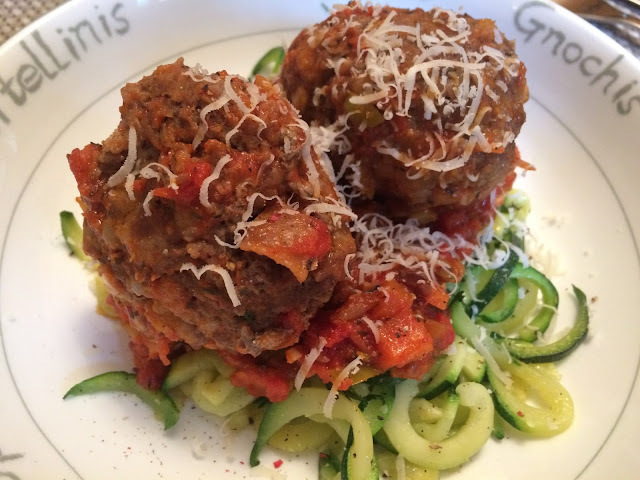 I'm not a huge meat eater anyway but sometimes there's nothing more satisfying than devouring a bowl of meatballs. These are slightly less indulgent when teamed with courgetti. My motto - everything is that little bit healthier with courgetti! I made these back in April when I added the Olive It! tapas cooking class with Omar Allibhoy. Which reminds me, did you try out the Olive and Manchego Coarse Pate? 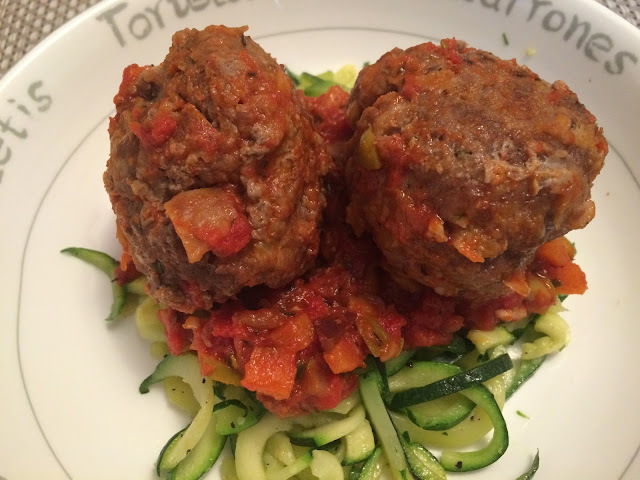 Although the cooking class wasn't what I expected - I thought it would be a tapas class made up of a few recipes for small dishes - it was great, and I made the pate and these meatballs fairly often. Wait until you see the dessert! 1. 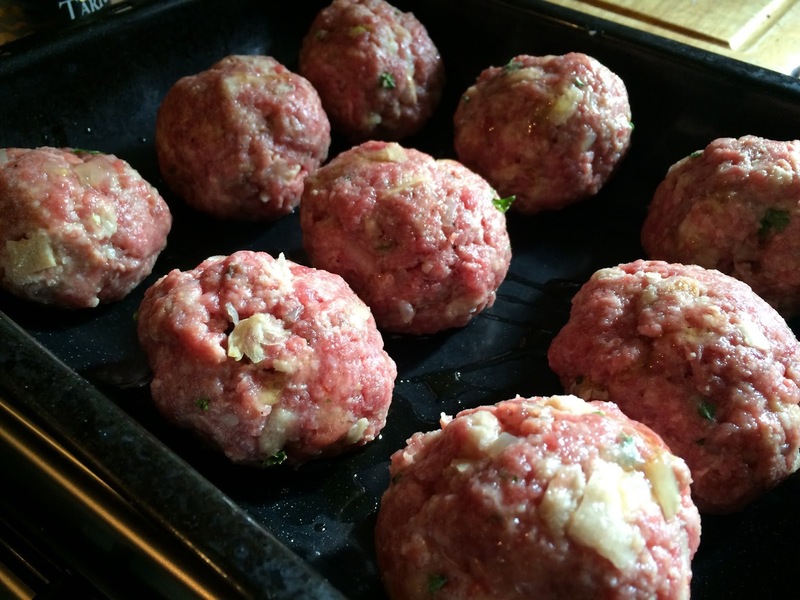 First things first, preheat your oven to 180 (fan assisted) BUT read step 6 first to decide how you're cooking the meatballs - if frying, skip step 1. If not, preheat your oven and grab a baking tray or roasting tin and either line with foil or lightly grease with EVOO. 2. Tear up your bread and soak in the milk. Leave for a few minutes. 3. Put the beef in a large dish, preferably shallow (or you could use a baking tray). Add the diced onion, parsley, garlic and seasoning. Squeeze the excess milk from the bread and add to the bowl. Also add the beaten egg. 4. Now is the messy bit - you'll need to knead the mixture in the bowl (with clean hands!!) for a few minutes so everything's well mixed. 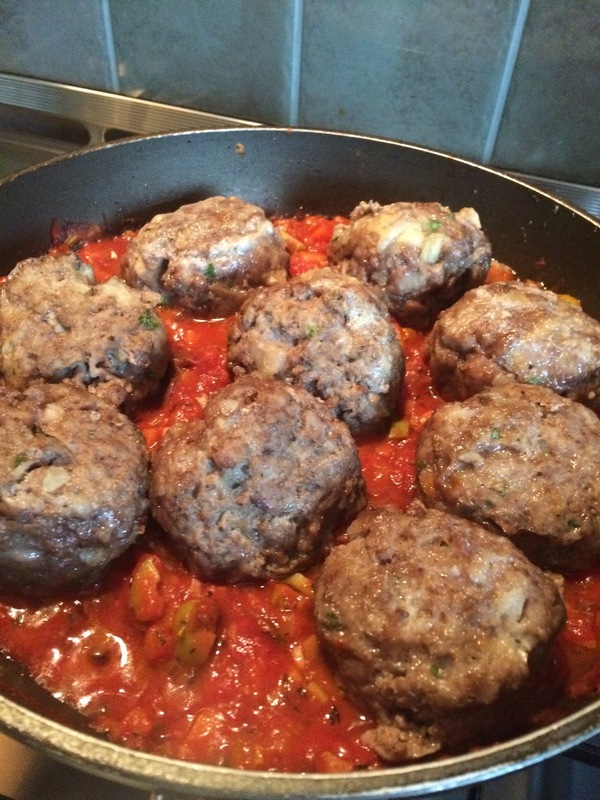 Don't knead for more than a couple of minutes or it makes the meatballs rubbery. 5. There's two ways to do the next bit - either roll the mince mix around each of the pitted green olives to make the balls OR form the ball first, poke the olive into the middle and roll for a few seconds to cover the olive. I find the latter the easiest. 6. There are also two ways to cook them - the traditional way, in batches fried in a little EVVO OR put in a roasting tin, drizzle with a little EVOO and pop them in the oven. They'll need roasting for around 10 minutes. 7. While they're cooking, make your sauce. Heat the oil in a large frying pan over a medium heat, adding the carrot, onion and garlic. Cook for a few minutes until the onions are softer but not coloured. Turn the heat down slightly. 8. Add the black olives, fresh herbs, seasoning, sugar and wine (if using) - you'll need to flambé by setting light to the pan using a lighter or long matches. Simmer until the wine has reduced by half before adding your chopped tomatoes. 9. If serving with courgetti, use your spiralizer now. 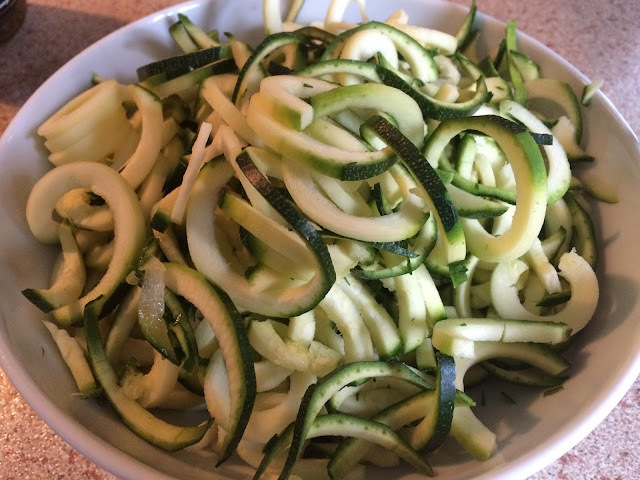 I normally serve my courgetti raw but you can also steam it in a saucepan with a couple of tablespoons of water for 5-10 minutes to soften. 10. Cook your sauce for a further 5 minutes on a low heat before adding the meatballs and cooking together for a further 15 minutes. 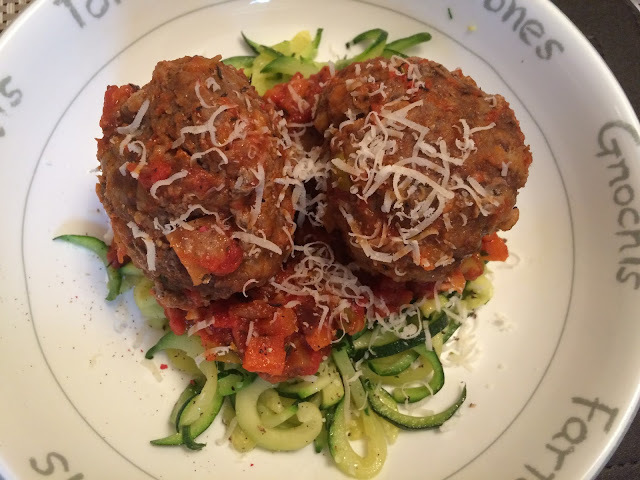 How do you make your favourite meatballs?